A BLUE roadster, traveling at high speed, rounded a curve outside a New Jersey town and apparently vanished into thin air. Five minutes later, two motorcycle cops, flattened against whizzing machines, raced around the corner, flashed past a lumbering furniture van and headed after the stolen car. Without knowing it, they had already passed it. Snugly housed within the big van, the roadster was already the center of attention of a corps of experts. License plates were being shifted; wire wheels were being substituted for wooden ones; gray, quick-drying paint was being applied to hood and body. A hundred miles away, across the state line, the van stopped, A light steel runway slid to the ground from the rear of the truck and a gray roadster, with wire wheels and Pennsylvania license plates, rolled to the pavement ready for sale to an unsuspecting buyer. The latest trick of a motor-stealing mob had worked and the police were baffld. The detective who told me of this ruse, estimated that the automobile stealing racket in the United States has mounted to a $50,000,000-a-year business. 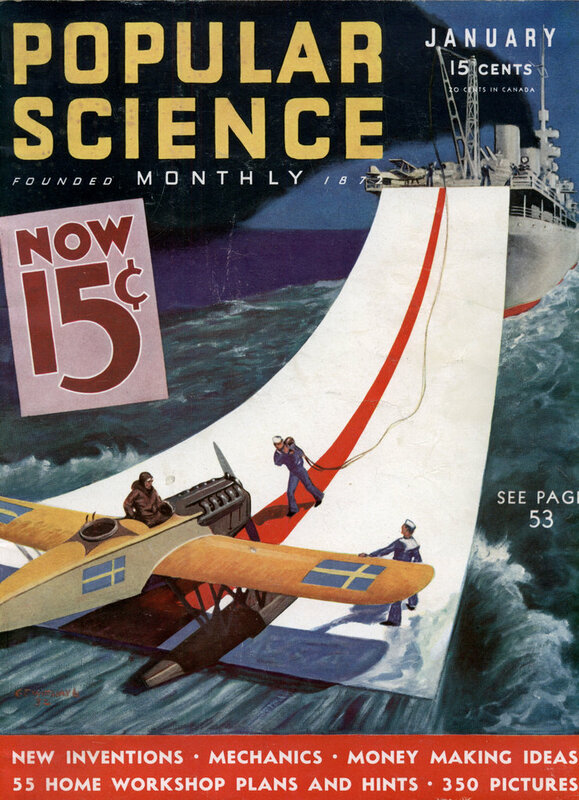 During the first six months of 1932, 36,000 machines disappeared in seventy-two American cities alone. 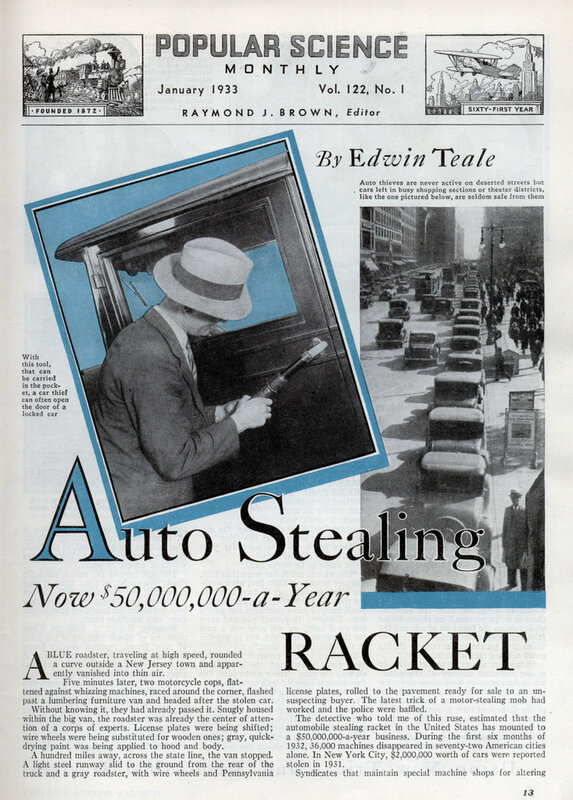 In New York City, $2,000,000 worth of cars were, reported stolen in 1931. Syndicates that maintain special machine shops for altering stolen cars, motor-theft gangs that steal machines to order, and mobs that dispose of their “hot cars” through chains of subsidized garages operating in small towns are modern features of this gigantic racket. At the head of every gang, Capt. Edward J. Dillon, for eleven years head of the Automobile Squad of the New York City police, told me, there is a mastermind who does the planning and directing. Under him, specialists form the cogs of a smooth-running machine. The “spotter” or “finder” spends his time picking out cars to be stolen, studying the habits of their owners and choosing the best time for the theft. The “getaway-man” does the actual stealing. Another alters the motor numbers and changes the appearance of the cars before they are offered for sale. This underworld mechanic is known as a “grease ball.” In addition, there is a “paper man,” an expert forger who prepares the fake bills of sale and the false registration certificates by means of which the purchaser is thrown off his guard when a sale is made. Delighted at the prospect of getting more than he expected, the owner goes off with the note. Three weeks pass. The showroom is crowded with cars. The partners seem to be doing a thriving business. Then, one morning, the owner passes the place and can hardly believe his eyes. The showroom is clean as a whistle. Every car has disappeared over night! Members of the gang have drifted into town and stealthily driven the machines away while the citizens slept, heading in all directions to make tracing difficult. The partners are gone. And, at the bank, the owners get another jolt. The notes are worthless scraps of paper. The best part of the racket, from the crooks’ viewpoint, is this: Even if they are caught, they face only a civil trial, not a criminal one. According to law, they have not stolen the cars; they have bought them with worthless notes. Recently, Harold G. Hoffman, Commissioner of Motor Vehicles of the State of New Jersey, reported another ingenious ruse being used by auto thieves. A stolen car is left at one of the small garages controlled by the gang. Some time later, the owner of the garage appears with a large bill for storage and fictitious repairs to obtain permission from the Motor Vehicle Department to sell the machine under the Garage Lien Act. Such permission, when granted, gives him a clear title to the car, making it easy to dispose of. To outwit this strategy, the Department is making special investigations in connection with all applications of the sort. Last year the Director of the Chicago Crime Commission, Henry B. Chamber-lin, told me of a gang that specialized in stealing cars to order. Chauffeurs acted as agents. When they heard of someone in the market for a certain type of secondhand machine, they would approach him with the story that “a friend” had just such a car which he would sell cheap. Then the mob would pick out the required kind of automobile on the street, steal it, and turn it over to the buyer in a transaction too fast to give him time to think. Not infrequently, I am told, a gang will place one of its ace “spotters” as a workman in a large garage. In New York City, not long ago, the loss of nearly two dozen cars was traced to the activity of one such inside worker.” He would pick out a car and then, during lunch hour, take the key to a nearby locksmith to have a duplicate made. This duplicate, together with the license number of the machine and the address of the owner, was then turned over to the gang’s getaway-man, who had an easy job locating the car and making the theft with his duplicate keys. Another getaway-man worked as a bellhop in a midtown New York hotel. He would steal away from his post, drive a car which had been picked out to the gang’s garage, and then return to duty. If he were suspected, the records at the hotel would show he had been working there at the time the theft occurred. Invariably some such alibi is carefully worked out beforehand. His brother owned a car that looked identically like the one he had taken. He had duplicate keys and permission to drive it at any time. That morning, his brother had told him he would leave the car parked near the store for him to pick up. When he saw the machine there, he was so sure it was his brother’s car that he had stepped in without looking at the license plates. Officers brought his brother to headquarters. He verified the story of the suspect just as he had told it. Continuing their investigations, the police made a remarkable discovery. The two men, they found, were members of a gang that specialized in stealing one make of automobile and the car “owned by the brother” had been purchased by the gang to provide an alibi in case the getaway-man failed to get away! What sort of car is most likely to be stolen? The answer is: a medium-priced, well-advertised, popular make of machine. Such cars are in wide demand and consequently easy to dispose of. The particular make of auto that is most frequently stolen varies from year to year, according to shifts in public taste. Thieves keep their fingers on the pulse of popularity and choose machines most in favor at the moment. Machines with unusual bodies, with strikingly odd-colored paint, and cars that are too old or out-of-date or have an initial cost that was too high or too low, are most likely to be immune from theft. High-priced cars are too hard to sell and cheap cars don’t bring enough to be worth taking. Consequently, the thief concentrates on the popular, middle-priced, widely-used makes, favoring new models with the latest equipment. The zero hour for stolen cars is between eight and ten p.m. More machines disappear then than at any other time during a day. The most dangerous spot in a city to leave your car is the theater district. The center of the shopping section is another risky place. Cars are coming and going all the time and the thief attracts no attention as he drives away from the parking place. Curiously enough, the bigger the crowd, the greater the danger of your car being stolen! Spots near a stadium where baseball games, prizefights, or wrestling matches are held, are familiar hunting grounds for the auto thief. The assurance that the owner will be gone for a definite length of time gives him the opportunity to use his taped pipes for snapping door locks, his ingenious “jump wire” devices for getting around locked switches, and his big assortment of duplicate keys for starting the car he picks out. There are three ways in which thieves handle a “hot car” after they steal it. They may hide it until the storm blows over; they may “scramble” it and then try to sell it; or they may attempt to dispose of it immediately. A year or so ago, a brand-new sedan which had been driven only five miles was stolen at Portland, Oregon, and appeared again the following spring. It had been hidden under hay in a barn during the winter. Capt. Dillon, told me of another case in which a thief in upstate New York was so frightened by his near capture that he left the machine he had stolen under hay in a barn for nine months. When he brought it out, rats had eaten away the whole top. But it had been on the road only a week when police arrested him! Usually gangs try to dispose of their stolen machines in rural communities where they are less likely to come to the attention of the city police. In “scrambling cars,” a number of machines of the same make and model are stolen at the same time. In some underworld garage, they are then torn apart. Wheels are switched, transmissions shifted, bodies changed, and engines transferred from one car to another. In one case, twelve machines of the same design were taken apart and scrambled by a New York gang to hinder identification. A special garage, midway between New York City and Philadelphia, Pa., used to be used for altering and scrambling stolen cars. SOME gangland mechanics are past-masters of camouflage. There is one instance actually on record in which a country storekeeper bought his own machine three times! A gang stole it, camouflaged it and sold it back to him twice. He finally grew suspicious when his pet dog appeared to recognize the car, jumping up into the seat as soon as it was driven into the yard. If the trained experts of the automobile squads can examine a machine thoroughly, they can identify a stolen car in spite of the most cunning camouflage. They have at their disposal secret means of identification unknown to the ordinary officer. By means of special asbestos sheets and blowtorches, they can bring back altered numbers on motors. In Los Angeles, Calif., a system of “finger-printing” auto tires to help track down thieves has been developed. Elaborate cross-filing systems and frequent check-ups of the motor numbers on registration lists provide valuable clues. In one western state, a few years ago, twenty-five machines were found registered with the same motor number! Recently, thanks to the radio police cars which receive descriptions of stolen machines while cruising about the streets, the recoveries in large cities have mounted to approximately eighty percent of all the automobiles stolen. Probably the most cunning stratagem of all was worked out by a lone wolf auto thief in New York City. It enabled him to dispose of twenty-one stolen machines before he was caught. With his wife and baby, he would drive up and down the main streets of the city until he found a parked machine exactly like his own with an empty space either ahead or in back of it. Then, he would park his own machine in this empty space and all three would go into a store for a minute or two, come out and “by mistake” enter the wrong machine and drive away. A complete set of keys for that particular make and model permitted him to open doors and unlock switches and transmissions. If the owner saw him, he would apologize for his error and get into his own machine, of identical appearance. Another daring ruse is often resorted to by gangs to make a quick sale. After a machine of a particular make has been spotted, an advertisement is inserted in a newspaper offering for sale the auto which is yet to be stolen! Those interested are requested to call a certain number. When they do, they are told the car will be parked at the appointed hour directly across the street from “our downtown showroom,” giving the address of a leading dealer in that make of machine. The “hot car” is parked at the spot a few minutes before the customer arrives. The customer is told a plausible story as to why the company across the street is able to sell the machine at a ridiculously low price. After a few minutes, the “salesman” says: “I like your looks. Wait a minute.” He goes across the street into the showroom where the customer sees him talking to the men inside. In reality, he is asking if he can borrow a pencil or wash his hands. But, when he returns, he announces that “his partners” have agreed to an extra-special price for a quick sale. The buyer pays cash and receives the papers which have been prepared beforehand. His receipt is signed . with a flourish, “vice-president,â€”Company.” He never realizes he has not dealt with the authorized dealer until a motorcycle cop tells him to pull over to the curb and he learns he is driving a stolen car! DURING the last two years, business conditions have given rise to another problem for the men of the automobile squad. Owners are hiring thieves to steal their cars! The thief gets $100 to destroy or alter the machine so it will never be recovered, while the owner, at the end of sixty days, collects his insurance in ready cash. In New York City, last year, a manufacturer and a storekeeper were caught dealing with such thieves. In both cases, the exposure ruined their credit and forced them out of business. One authority with whom I talked, gave me the amazing estimate that twenty-five percent of all the autos reported stolen today are never stolen at all. The owners hide them, run them into swamps, or tear them to pieces and report they have been stolen to collect the insurance. Again, each year, hundreds of people who receive parking tickets try to escape paying the fines by telephoning headquarters that their cars have been stolen and then maintaining the thief had left the machines where they were given the tickets! (1) Don’t park it in the same place every day. This gives the thief a chance to study your habits or copy lock numbers and get keys to fit. (2) Never leave your car for any length of time unlocked. Seventy percent of all cars that are stolen were left unlocked by their owners. Automobiles with doors and switches or transmissions locked are rarely taken. 3) Be sure the windows are all closed tightly when you lock your machine. Rear windows, particularly, are often left down an inch or so without attracting the attention of the owner and provide a chance for the thief to get inside. (4) Never leave your car with the engine running even in your own driveway or when you intend to be in a store no longer than a minute. It takes but a few seconds for a thief to step on the gas and get away while your back is turned. (5) And, be especially on guard after dark when parking near theaters or other places of entertainment where you will be gone for several hours. (1) Watch out when the seller wants cash instead of a check. (2) Take time to investigate when the price seems too low or when the seller appears willing to do too much for you. (3) Don’t close the deal in a hurry. Wait a week before giving your final decision. Auto thieves can’t wait; they have to sell in a rush. (4) Be on your guard when the seller gives as his reason for disposing of the car the fact that he has “gone broke in Wall Street” or has lost money on the races. These are stock excuses among auto thieves so don’t take them at their face value. (5) And, finally, if you are at all suspicious, and live in a large city, call up headquarters and have the engine number compared to those on the list of stolen cars.